RECIPE: Pull-Apart Cheese Bread, Or Halloween Brain Bread? 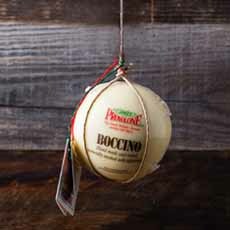 Provolone, originally made in a round or oval shape, is now made in loaves and wheels as well (photo courtesy DiBruno Brothers). Bel Gioioso, the Wisconsin-based Italian cheesemaker, sent us this pull-apart cheese bread recipe. 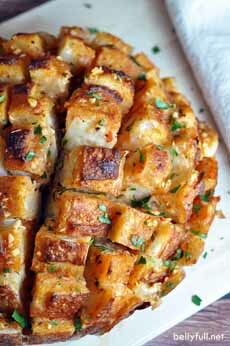 A boule (ball)-style Italian pull-apart bread, it’s made with provolone cheese, marinara sauce, garlic and seasonings. We renamed it “brain bread” for the Halloween season. For snacking, with a beer, or at the dinner table, it’s a special treat that’s actually easy to make—you start by buying a sourdough boule. The recipe was developed for Bel Gioioso by Amy of BellyFull.net. Prep time is 20 minutes, cook time is 25 minutes. 1. PREHEAT the oven to 375F. Tear off a large enough piece of foil to wrap around the loaf. Coat the foil with nonstick spray and place on a baking sheet. 2. CUT the loaf of bread into 1-inch-wide slices with a serrated knife, leaving about 1/4-inch of the base of the bread intact (i.e., cut the slices down to the bottom quarter-inch, but don’t slice through the bottom). Repeat the cuts in the opposite direction to create a cross-hatch/cubed pattern (photo #1). Place the bread on the foil. 3. PRESS the provolone pieces between all the slices of bread. In a small bowl, whisk together the butter, marinara, minced garlic, garlic powder, onion powder and Italian seasoning. Gently pry apart the bread pieces and drizzle the mixture over the loaf evenly, making sure to get into all the seams and cover all the pieces. 4. WRAP the bread up in the foil. Bake for 15 minutes. Open up the foil, increase oven temperature to 425°F, and bake another 10 minutes until the cheese is melted and the bread is golden brown. Let stand 5 minutes before serving. Sprinkle with parsley, pull apart the pieces and serve.